Old Guard adherents led by a Beth Mason bottom feeding fish are showing frustration as Carmelo Garcia's Hoboken Housing Authority contract faces the prospect of termination at a special meeting in City Hall Monday night. With no supporting fact whatsoever, the Mason political operative deems any contract termination "illegal." The hysteria has more to do with a prominent uptown based developer with a long history of political influence in Hoboken, the HHA and its buildings in the second ward. Beth Mason spent over $50,000 in street money to obtain fewer votes in 2011 then her council run in 2007 staving off a runoff by a mere 10 votes. Without that developer backing in the second ward, Beth Mason who lost any semblance of a base years ago is facing the humiliating prospect of losing her council seat in 2015. Following the MSV breaking story on Tuesday, the Hudson Reporter followed oddly voicing uncertainty about the contract termination being legal. No source or reference in any way to Garcia's contract was offered explaining why. One MSV commenter yesterday smartly asked who was behind that unsupported narrative. 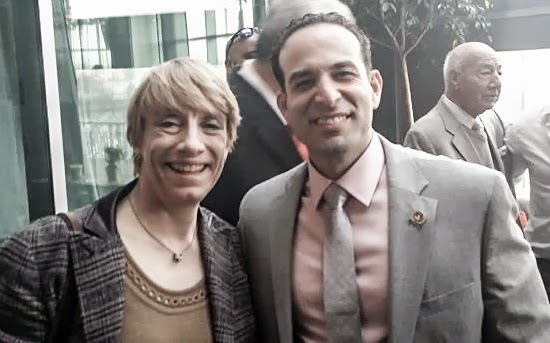 Beth Mason is expected to try to further aid Carmelo Garcia Monday night at the HHA special meeting but her reasons have more to do with political self-preservation then Mister Carmelo. She needs the developer backed votes in the second ward if she has any chance to hold on to any political office, in this case the second ward council seat. For those who don't feel compelled to have a read, it's quite simple. Terminate at will.